Super cute in Soda Bay! This darling 3 bedroom 2 bath home sits on two lots, giving you more room to grow. All updated throughout with unique touches all around. Beautiful modern dark wood floors flow through the open living, kitchen and dining areas and down the hall to the bedrooms. Bright sunny windows wrap around giving nice natural light and views to the front and side yards. The kitchen has the shabby chic feel with painted white cabinets, custom concrete counter tops, and stainless appliances. Two spacious guest rooms with new carpet and paint, and an updated guest bath with new vanity, fixtures, paint and floors. Down the hall you will find the large master with slider to backyard, big closets, and new carpet and paint. The master bath has a nice standing shower with handmade wood counter tops, new paint, and new fixtures. 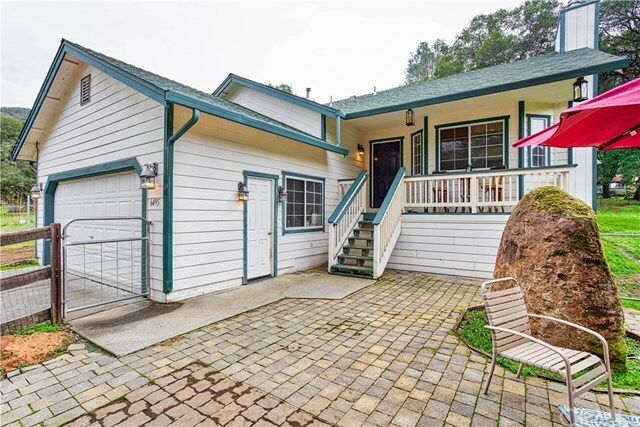 Great location only 10 minutes to Lakeport, very private feel with tons of yard space for entertaining, gardening, kids play areas, and so much more! Inclusions: 6493 Soda Bay Rd.